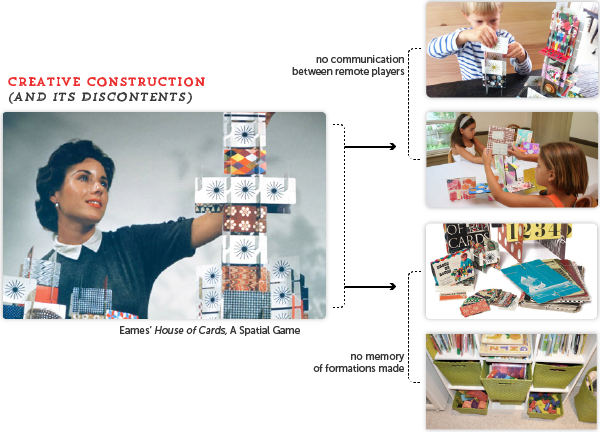 Thanks to toys like wooden blocks, dollhouses, and the Eames House of Cards, children around the world have grown up cultivating spatial thinking. They project domestic, urban, and infrastructural scenarios; they play games and engage in creative 'placemaking' with these configured and reconfigured miniatures. Yet rarely, if ever, are children encouraged to continue playing... to take their designs out in the greater world and share. Our game, Mnemonic Making, enables both children (and adults interested in space) to save, share, and elaborate on their designs with others and over time. 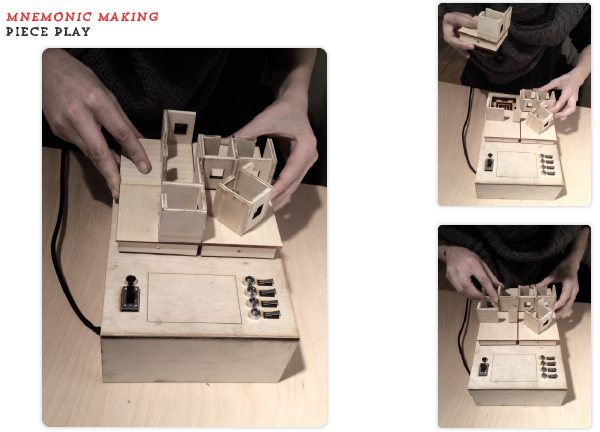 Using simple 'block' pieces, Mnemonic Making combines the tactile materials and spatial imagination of traditional models and building games with the tactile interfaces of physical computing and memory functions of php. 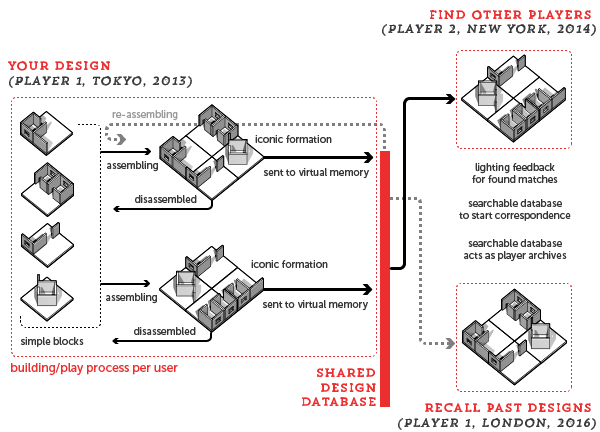 Leveraging the popularity of game simulations like sim-city, the toy's pieces and positions can be saved to a shared, online database. 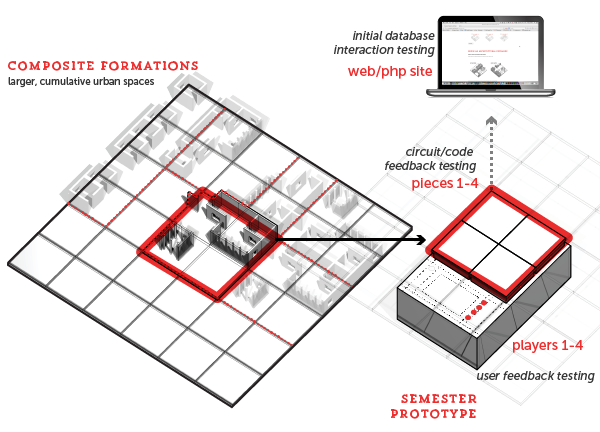 There, a community of users can access their past work as well as others' spatial designs. Potential links with existing social networks (Facebook, Twitter, Tumblr, etc.) would then enable users to share their work and collaborate on larger, cumulative models. Plug-ins, for compatibility with the Sim Games and Second-Life, could then allow users to reach beyond the initial Mnemonic Memory player community and give their spaces a virtual life. Together, the architectural imagination would traverse a range of actual, imaginary, and virtual worlds. In advance of creating a full grid and multiple players, we've prototyped a smaller, simpler section of grid. Multiple save buttons mimic having several users. With this smaller section, we've been exploring sensor sensitivity, different contact types, and visual and auditory feedback. As in the larger toy, sounds signal piece placement and detection. Lights on the save buttons signal that a configuration has saved. And, finally, blinking lights appear within the pieces when you stumble upon a match. Step right up and see if you can register some contacts & constructions! Flip through this site and explore the virtual interface options that extend the 'memory' of the Mnemonic Making community.